The billions of Zero Asset citizens of Earth are free from their sectors, free from the prospect of extermination from orbit, for Alan Saul has all but annihilated the Committee by dropping the Argus satellite laser network on it. The shepherds, spiderguns and razorbirds are somnolent, govnet is down and Inspectorate HQs are smoking craters. But power abhors a vacuum and, scrambling from the ruins, comes Serene Galahad. She must act before the remnants of Committee power are overrun by the masses. And she has the means. Var Delex knows that Earth will eventually reach out to Antares Base and, because of her position under Chairman Messina, knows that the warship the Alexander is still available. An even more immediate problem is Argus Station hurtling towards the red planet, with whomever, or whatever trashed Earth still aboard. Var must maintain her grip on power and find a way for them all to survive. As he firmly establishes his rule, Alan Saul delves into the secrets of Argus Station: the results of ghastly experiments in Humanoid Unit Development, a madman who may hold the keys to interstellar flight and research that might unlock eternity. But the agents of Earth are still determined to exact their vengeance, and the killing is not over.. ...Zero Point is a thoroughly enjoyable novel with some very interesting ideas. Asher doesn't fail in making this second volume of the Owner trilogy a step up from The Departure, adding in plenty to keep the pages turning. For those familiar with his Owner short stories there are some nice treats in store, and for those that haven't.... well, what are you waiting for? In short, Zero Point is well worth reading, and I will be very much looking forward to Jupiter War! I practically devoured Zero Point in a few lengthy reading sessions. The book was a real page turner. Neal Asher's trademarks were all there, action, imagination and great world building. All the story arcs are of the kind where you just want to read one last chapter before turning the lights off, and then it turns to two, then three. Just like The Departure I get the feeling we have still only scratched surface of what lies hidden in The Owner universe. I will be there for part three. In the meantime I’m back to my stack of unread Asher books. However much he might make me squirm and give me brain ache, I get a kick out of reading his work and seeing how hard sci-fi should really be done. Overall, pretty good. I'd say overall the first novel was a bit better because of the novelty of the characters and tech, but the end on the second was much more of a page turner for me. 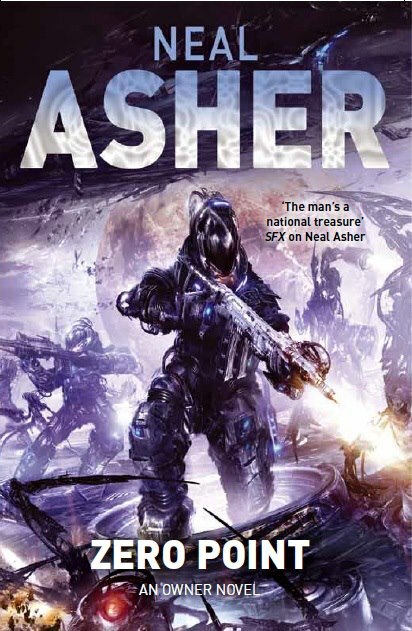 Asher again balances the tension and action beautifully in this novel, and I can’t wait to read the next one. While The Departure might have shifted away from what some consider typical Asher, Zero Point brings it back. It doesn’t have homicidal aliens and deadly ancient tech, but it has all the explosive action scenes and various humans having chunks carved out of them that you might expect of his work. I know the Owner books have taken some flack for not being standard fare, but that’s part of the appeal for me.